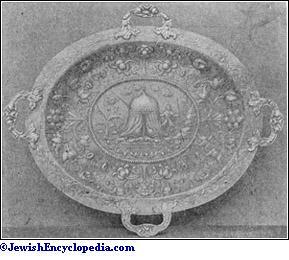 Silver Salver Bearing the "Arms of the Tribe of Judah. 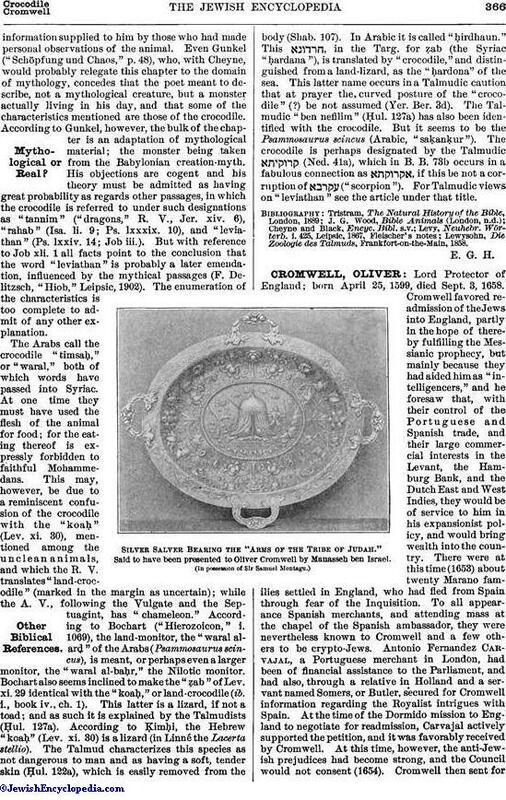 "Said to have been presented to Oliver Cromwell by Manasseh ben Israel. 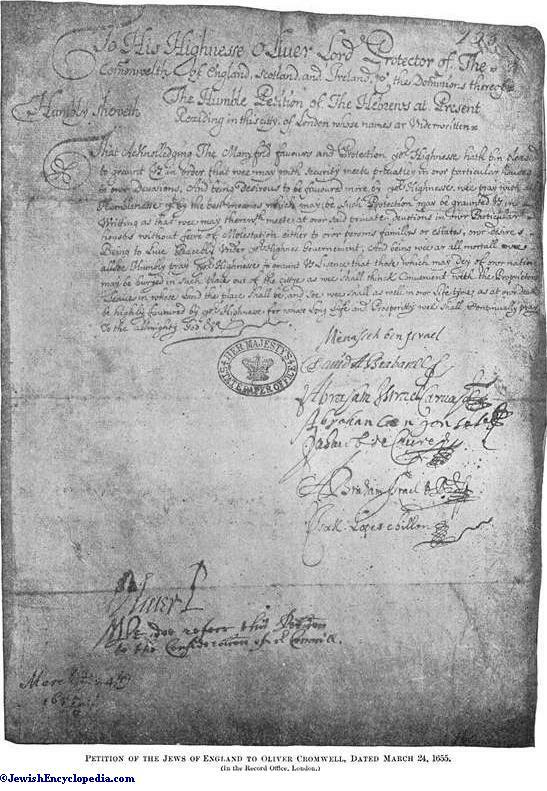 Petition of the Jews of England to Olivfr Cromwell, Dated March 24, 1655. Lord Protector of England; born April 25, 1599, died Sept. 3, 1658. Cromwell favored readmission of the Jews into England, partly in the hope of thereby fulfilling the Messianic prophecy, but mainly because they had aided him as "intelligencers," and he foresaw that, with their control of the Portuguese and Spanish trade, and their large commercial interests in the Levant, the Hamburg Bank, and the Dutch East and West Indies, they would be of service to him in his expansionist policy, and would bring wealth into the country. There were at this time (1653) about twenty Marano families settled in England, who had fled from Spain through fear of the Inquisition. To all appearance Spanish merchants, and attending mass at the chapel of the Spanish ambassador, they were nevertheless known to Cromwell and a few others to be crypto-Jews. Antonio Fernandez Carvajal, a Portuguese merchant in London, had been of financial assistance to the Parliament, and had also, through a relative in Holland and a servant named Somers, or Butler, secured for Cromwell information regarding the Royalist intrigues with Spain. 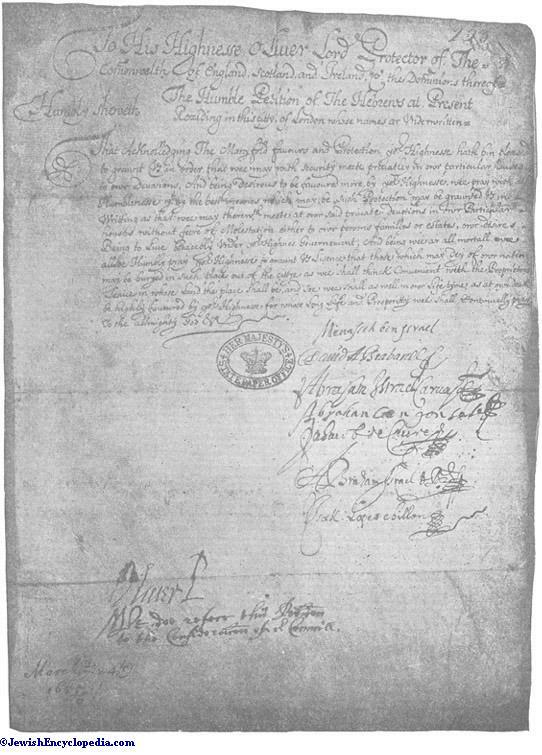 At the time of the Dormido mission to England to negotiate for readmission, Carvajal actively supported the petition, and it was favorably received by Cromwell. At this time, however, the anti-Jewish prejudices had become strong, and the Council would not consent (1654). 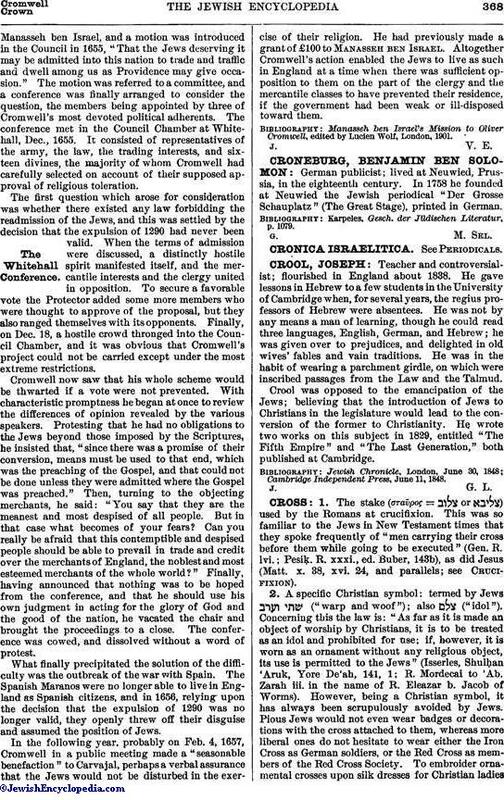 Cromwell then sent for Manasseh ben Israel, and a motion was introduced in the Council in 1655, "That the Jews deserving it may be admitted into this nation to trade and traffic and dwell among us as Providence may give occasion." The motion was referred to a committee, and a conference was finally arranged to consider the question, the members being appointed by three of Cromwell's most devoted political adherents. The conference met in the Council Chamber at Whitehall, Dec., 1655. It consisted of representatives of the army, the law, the trading interests, and sixteen divines, the majority of whom Cromwell had carefully selected on account of their supposed approval of religious toleration. The first question which arose for consideration was whether there existed any law forbidding the readmission of the Jews, and this was settled by the decision that the expulsion of 1290 had never been valid. When the terms of admission were discussed, a distinctly hostile spirit manifested itself, and the mercantile interests and the clergy united in opposition. To secure a favorable vote the Protector added some more members who were thought to approve of the proposal, but they also ranged themselves with its opponents. Finally, on Dec. 18, a hostile crowd thronged into the Council Chamber, and it was obvious that Cromwell's project could not be carried except under the most extreme restrictions. Cromwell now saw that his whole scheme would be thwarted if a vote were not prevented. With characteristic promptness he began at once to review the differences of opinion revealed by the various speakers. Protesting that he had no obligations to the Jews beyond those imposed by the Scriptures, he insisted that, "since there was a promise of their conversion, means must be used to that end, which was the preaching of the Gospel, and that could not be done unless they were admitted where the Gospel was preached." Then, turning to the objecting merchants, he said: "You say that they are the meanest and most despised of all people. But in that case what becomes of your fears? Can you really be afraid that this contemptible and despised people should be able to prevail in trade and credit over the merchants of England, the noblest and most esteemed merchants of the whole world?" Finally, having announced that nothing was to be hoped from the conference, and that he should use his own judgment in acting for the glory of God and the good of the nation, he vacated the chair and brought the proceedings to a close. The conference was cowed, and dissolved without a word of protest. What finally precipitated the solution of the difficulty was the outbreak of the war with Spain. The Spanish Maranos were no longer able to live in England as Spanish citizens, and in 1656, relying upon the decision that the expulsion of 1290 was no longer valid, they openly threw off their disguise and assumed the position of Jews. In the following year, probably on Feb. 4, 1657, Cromwell in a public meeting made a "seasonable benefaction" to Carvajal, perhaps a verbal assurance that the Jews would not be disturbed in the exercise of their religion. He had previously made a grant of £100 to Manasseh ben Israel. Altogether Cromwell's action enabled the Jews to live as such in England at a time when there was sufficient opposition to them on the part of the clergy and the mercantile classes to have prevented their residence, if the government had been weak or ill-disposed toward them. Manasseh ben Israel's Mission to Oliver Cromwell, edited by Lucien Wolf, London, 1901.